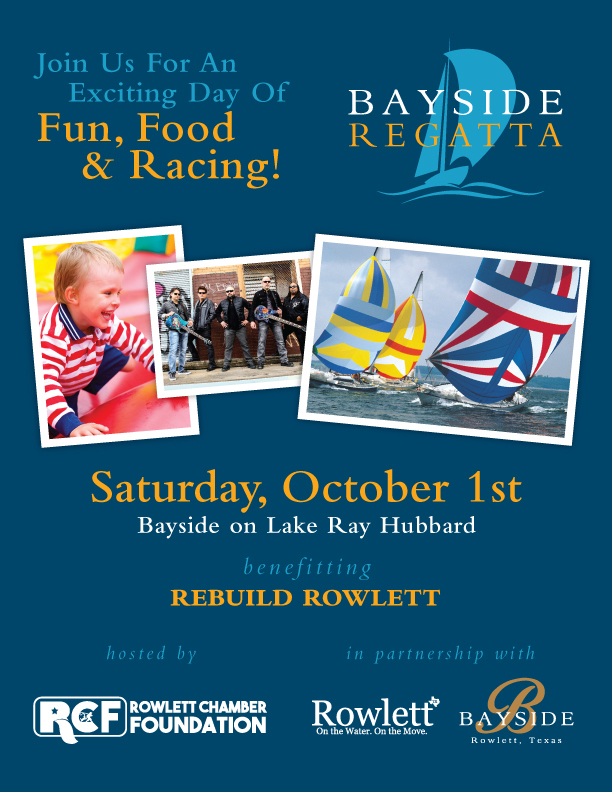 The Regatta benefits Rebuild Rowlett a long-term recovery group working to help victims of the devastating 2015 Rowlett tornado. All funds raised during the Regatta will aid the people who lost everything and help them rebuild their lives. For more information about the organization's& efforts, visit RebuildRowlett.org. Set on the shores of Lake Rey Hubbard in Rowlett, Texas, Bayside is a 262 acre mixed use development that combines the best of luxury living, shopping, and one-of-a-kind entertainment. Bayside is designed around a pedestrian-friendly, open-air concept with lush green space, a marina, and hundreds of thousands of square feet dedicated to lakefront shopping and restaurants. Signature amenities will include Texas's first 8-arce Crystal Lagoon with beach entrance plus the nation's most spectacular Show Fountain with shows planned nightly. The community includes luxury apartments, high-rise condos and townhomes, mixed-use entertainment and dining space and commercial retail and office space. For more information visit discoverbayside.com.